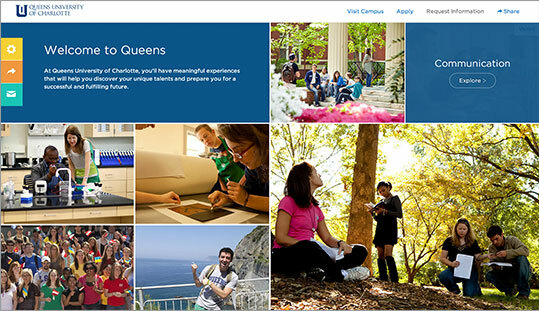 With a small but driven student population and a jaw-droppingly gorgeous Southern campus, Queens University of Charlotte needed a way to put itself on the radar of prospective students while competing in a crowded space traditionally owned by larger colleges. Situated just outside of downtown Charlotte, North Carolina, Queens is a private school with fewer than 2,500 students and strong student development programs. In a world dominated by big public institutions with tens of thousands of students, Queens positions itself as the quieter, smarter alternative for a rich, quality education. Although a majority of Queens students are from the region, only about 30 percent of prospective students know about the school. The client wanted to showcase not only the diversity and opportunity of the school, but the proximity to Charlotte’s attractions and the school’s internship opportunities and travel abroad program. At Noble, we put ourselves in the role of high school juniors and seniors faced with the daunting task of picking the right college. We immediately knew that if a student couldn’t visualize themselves walking around the campus, meeting up with friends while studying under a large, shady oak tree, chances were slim that school would make the cut. 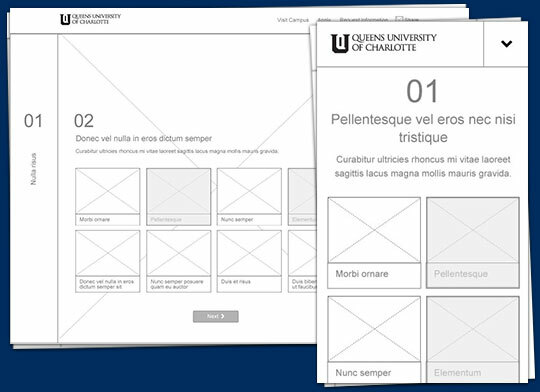 Our job was to make it dead simple for students to see themselves at Queens. From this line of thinking, the “Welcome to Queens” interactive tour was born. 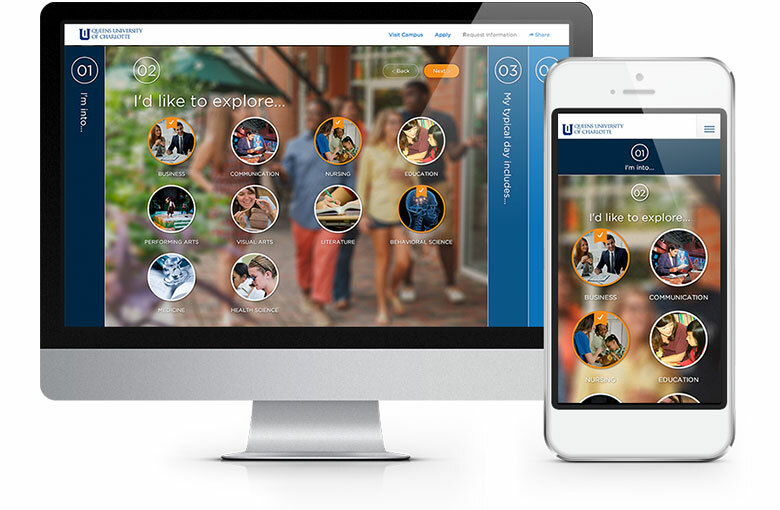 The fully-responsive tour allows users to “choose their own adventure” by picking from the school’s areas of study and extracurricular interests to see what life is like for students with specific majors. 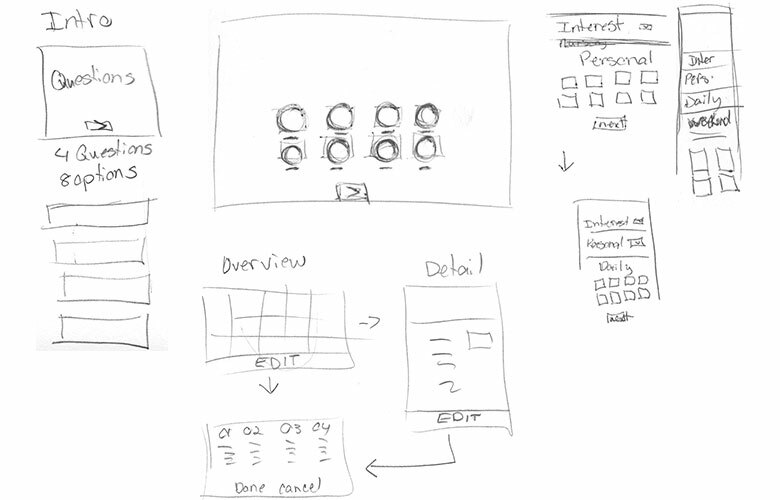 Detailed wireframes allowed for testing and validating of the user experience. English majors, for instance, could create a personalized tour based on their individual interests and values. 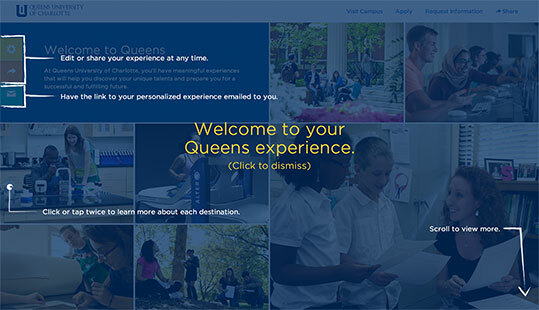 The resulting tour shows them visually what a typical day at Queens looks like for them. Maybe it’s sipping java in an off-campus coffee shop or checking out a concert at the area Performing Arts Center. With stunning photography and vivid descriptions of these activities, students get a taste of campus and Charlotte life, with the ultimate goal of getting students to book an in-person tour of Queens. On the technical side, Noble developed the tour’s front end, integrating it within Queens’ existing CMS platform for easy editing. We then trained the Queens staff on how to add and edit content as needed. New users are greeted with an overlay that shows them how to navigate the tour. A spread of lifestyle-related images help prospective students visualize having an active and fulfilling college career at Queens. Each stop on the tour has its own detail page, allowing rich content to set the tone for what students might experience at Queens. We created several content modules so the client could mix and match the information they provided. One module allowed the inclusion of student and teacher testimonials, adding an additional layer of personality. Social sharing gives students the chance to show the world their personalized Queens tour. Launching in late 2014, the site quickly earned national attention. Noble’s Queens project was recognized with a pair of MobileWebAwards, including Best University Mobile Website and Best of Show Mobile Website for 2014.